Trusted Review- How do you find one? Anonymous- People leave Anonymous reviews when they’re not comfortable exposing their names or themselves. They also do it for convenience as it reduces the time and steps to writing the review. Lastly a small percentage of businesses will write or hire someone to write positive reviews on themselves. These can usually be identified by looking at a few data points; where they written on the same day? Do they generally say the same thing? Are they short in content and description? 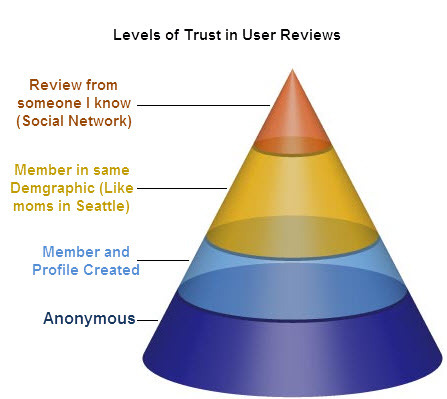 The key to using anonymous reviews as a data point is to look for volume and trends, then base against other types of reviews and data points. A business that is not reputable will usually have lots of bad reviews (both anonymous and member created) spread out over time. The content of the review can also say a lot, is someone complaining about the speed of service at a 5 star restaurant where the food should come out slower? Be fair and cautious about jumping to snap judgments and before writing a place with a few bad reviews off, look at other data points. Judy’s Book labels all anonymous reviews on our site for easy identification. We also don’t give them as much weight in our algorithms when computing top places. Member created- The next best reviews are from the people who created an account and added their profile information to the reviews. This user is willing to back up their words by exposing their name and profile. While this can also be faked most people are honest and on a Social Search site you can usually tell if this is a valid user. We’ve put in code and process to identify fake and spam listings and are continuously updating them. Members in the Readers Demographic- One of the things our research has shown is people want reviews from others in their own demographic. If I’m a dad looking at a restaurant and someone says its kid friendly and I know they’re a mom or dad, it’s going to hold more weight. If I’m reading that a hotel room was big and spacious and the review was from someone in London versus Austin I’m going to assign a different weight to it. In the next few months we’re developing features that will help members create tags that can help other users get personalized relevant reviews. Starting with our largest set of users “Moms”. Reviews from Your Social Circle- These are your trusted friends and people you know. Not only should these hold the most weight because they can be trusted. But they can also be personalized. My friend Mike knows I like good wine, when recommending a restaurant to me he’s going to make sure they have an extensive wine list. My co-worker likes fresh produce, in recommending a place to shop I sent her to a local farmers market. You can get great recommendations, places to avoid, and ideas from your friend’s books on Judy’s Book. We’ve also integrated with Twitter and Facebook. Local Social Search tools are the main focus of Judy’s Book. The challenge your social network might not cover enough places and experiences to give relevant results. Hence the reason why Judy’s Book strives to provide a breadth of information and tools for you to make the best decisions. This entry was posted in Judysbook on August 9, 2011 by judysbookblog.